Bow hunting is like golf in a lot of ways. It can be extremely exhilarating or it can be extremely frustrating, and oftentimes it’s both within just a few minutes. If you want to improve your bow hunting skills in order to get more enjoyment out of the sport then maybe you just need to work on something specific that’s common to many bow hunters. Below we’ve listed 10 of the most common bow hunting mistakes, and we will discuss each one in detail to help you improve your results when bow hunting. Using the Wrong Bow & Arrow Combination – Unfortunately, we see this mistake made far too often. Knowing which arrows (sizewize) and broad heads (weightwise) to combine with a crossbow is as easy as opening Google or the owner’s manual. We’re not sure if it’s impatience, incompetence or a combination of the two but a lot of bow hunting mistakes could be avoided simply by matching the right bow to the correct arrows. Most bow manufacturers provide advice for the type of arrows that should be used, and ignoring that advice is counterproductive and unsafe. Make sure that your bow works with carbon fiber, aluminum and hybrid arrows, and determine the minimum and maximum lengths for each arrow. Additionally, make sure your arrow heads are compatible with the arrow shafts and the bow itself. Losing Form/Not Practicing Regularly – Legendary football coach Vince Lombardi once said that “practice doesn’t make perfect. Perfect practice makes perfect.” If you aren’t having bow hunting success then maybe all you need to do is practice more – in the right way, and with the proper form. Ask someone who you respect as a bow hunter to give you some guidance, and follow their tips closely. If you notice that they do something that you don’t do then ask them why and try to emulate their form. Even if you have a solid shooting form it can be easy to lose your touch during the off-season, so prevent that from happening by engaging your practice targets regularly. Overbowing – You gain absolutely nothing by overbowing (using a bow that requires too much draw) and you could potentially be putting yourself and others in danger. Yes, you can achieve a higher arrow velocity with a higher draw. Far too often, though, hunters think they need more velocity when speed isn’t the issue. Bow hunting isn’t about who can pull the most taut bow back the farthest – it’s about successful hits. Anyway, practicing with a heavy draw might seem like a good idea in June but when December comes everything from your fingertips to the arrow head acts differently. Use as much pressure and velocity as you need, but don’t let your ego take you too far. Misjudging Distances – If you often think that your arrow is dead on point but it goes flying far or end up short…you’re not alone. Don’t worry, though, because this error can usually be cleared up by improving on your range finding. With time and experience you’ll become a better judge of distance. Until you learn the ropes, however, there are two tricks to correctly judging the distance from you to the target: rangefinders and pre-ranging. Rangefinders are like digital tape measures that you can attach to your bow. Improper Shot Placement – Shot placement is a concern for hunters whether the weapon is a bow or a gun; the problem is that bow hunting leaves more room for error. A lot of the shot placement mistakes made in the field have something to do with the #1, #2 and #3 mistakes on this list, but sometimes the issue is simply aiming for the wrong spot or not knowing how to aim. The best spot to hit a deer is about four inches above the first joint that’s below the shoulder. Aiming for a wild hog’s weak spot near the heart will take down these sometimes seemingly invincible animals, while the “middle of the middle” rule works for larger game like elk or bears. If your target is fleet-footed and likely to react to the sound of a bow then you should usually aim for the heart – this will allow you to inflict maximum damage whether or not the animal drops before it sprints. Getting Trigger-Happy or Waiting Too Long to Shoot – They are exact opposites yet they both cause equally bad results. If you shoot too soon then other animals might get spooked by the sound of the bow, or you might be passing up the opportunity for a perfect kill. If you shoot too late then the animal might have already detected your presence. 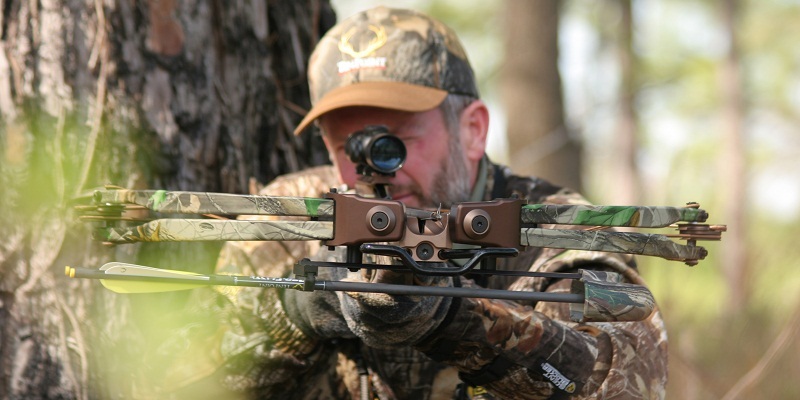 The key to solving this common bow hunting mistake is being aware of your surroundings. Know the distance and wind conditions. Shoot as soon as you have a clear shot of the area that will do the most damage to vital organs and when you’ve completed a pre-shot checklist. Choosing the Wrong Location – There are few worse feelings than planning on a major hunt but then spending the entire time waiting. You should use trail cameras to plot out the best spots, and try to figure out where other hunters are heading, if possible. You want to be in the hunting hot spots but you don’t want to be limited by inexperienced hunters or crowded areas. You should set your tree stands ahead of time, and don’t forget to plan your shooting lines and paths. Try to find a location that proves advantageous to you as a bow hunter. Lack of Stealth – No matter how many times it’s written or spoken about, there is always “that one guy” who is seemingly always bumbling around, failing to use scent eliminator, not having his bow cocked, breaking twigs, and making noise. We call him the “Mr. Magoo” of hunting but the only difference is that the real life version ruins things for everyone, including himself. Deer can detect a human the way humans can detect a skunk in a suitcase, so take every possible precaution to eliminate all human odors before heading out. Your hat, clothes, boots, tree stand and even your bow should leave no traces of your existence for a deer to find. One advantage of hunting with a bow is that you can shoot while keeping your location undisclosed, but you give up that advantage if you stink or are making noise unnecessarily. Failure to Arrive Early & Stay Late – The most dedicated hunters are usually the most successful. There is a definite correlation between persistence and achieving a goal, as long as you aren’t failing due to Albert Einstein’s definition of insanity, “doing the same thing over and over again, but expecting different results.” The first days of the hunting season are known as having the highest success rates because the animals have had time to “forget” that the presence of humans can also mean the existence of predators. And late in the season there are fewer hunters in the area so you have a better chance of bagging that big buck everyone’s been talking about for the last few months. You should even use the “arrive early, stay late” philosophy when deciding when to head to the stand and to pack it in. Overconfidence – No matter how good of a bow hunter you’re considered to be there is always room for improvement. Nature is always ready and willing to humble us when we think we finally “get it” so keep your head small and your broad heads sharp. Whether you think you’ve got the perfect shot or you think your archery skills are unmatchable, hunters consistently make the common mistake of overestimating their skills with a bow and arrow. It feels good when everything goes right, but don’t let that go to your head because the next time you are in a similar situation there is a good chance that things will wind up differently. Have you been sabotaging your bow hunting efforts with one of the aforementioned common mistakes? If so, we hope we’ve given you some helpful advice on how to rectify the issue. Bow hunting can be frustrating and it can be easy to fall into bad habits, but the goal of this article is to aid you in identifying and correcting problem areas. Use the Comments section below to let us know if you think you might be making bow hunting errors, or if you see people committing a specific bow hunting mistake too often and you’d like us to address it in an article. This is a standout amongst the most difficult parts with regards to shooting a bow. It shows signs of improvement the more you hone. It turns out to be considerably less demanding on the off chance that you introduce a peep locate. Notwithstanding the peep locate, you might need to incorporate a forward sight. Forward sight is generally connected to the exceptionally front of the bow and incorporates a stick and a level. Close one eye and utilize your prevailing eye to look through the peep. Once you’ve pointed effectively, you are currently prepared to take the shot.